- Publisher The King James Version Debate is the first book-length refutation of this point of view written for both pastors and laymen. The author concisely explains the science of textual criticism since the main premise advanced by KJV proponents is the superiority of the Greek text on which it is based. - Publisher D. A. Carson addresses laypeople and pastors with a concise explanation of the science of textual criticism and refutes the proposition that the King James Version is superior to contemporary translations. The King James Version Debate provides a readable introduction to two things: biblical textual criticism and some of the principles upon which translations are made. 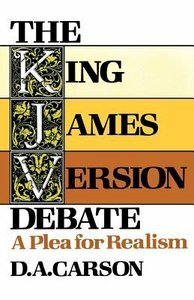 About "The King James Version Debate: A Plea For Realism"
The King James Version Debate is the first book-length refutation of this point of view written for both pastors and laymen. The author concisely explains the science of textual criticism since the main premise advanced by KJV proponents is the superiority of the Greek text on which it is based. D. A. Carson addresses laypeople and pastors with a concise explanation of the science of textual criticism and refutes the proposition that the King James Version is superior to contemporary translations. The King James Version Debate provides a readable introduction to two things: biblical textual criticism and some of the principles upon which translations are made. Dr Don (D. A.) Carson is currently Research Professor of New Testament at Trinity Evangelical Divinity School in Deerfield, Illinois. His areas of expertise include biblical theology, the historical Jesus, postmodernism, pluralism, Greek grammar, Johannine theology, Pauline theology, and questions of suffering and evil. Carson has written prolifically and profoundly on all these subjects. Carson has written or edited 57 books - as well as numerous journal articles - ranging from New Testament commentaries to topical studies on the state of the contemporary church and its wider cultural context. His work is characterised by brilliant theological insight, thorough scholarship, and an uncompromising commitment to the essentials of Reformed doctrine. Carson's landmark book, The Gagging of God: Christianity Confronts Pluralism won the 1997 Evangelical Christian Publishers Association Gold Medallion Award. Other works that examine the interaction of church and culture include The Inclusive Language Debate (1998), Becoming Conversant With the Emerging Church (2005), Christ and Culture Revisited (2008) and The Intolerance of Tolerance (2012). Carson's exegetical works include volumes on individual New Testament books in the Revised Expositor's Bible Commentary, Pillar New Testament Commentary, Baker Exegetical Commentary, and New International Greek Testament Commentary. In Exegetical Fallacies (1984, 1996, 2nd ed. ), Carson is at his incisive best, analysing the root causes of errors in biblical interpretation. He has also notably edited the New Testament Commentary Survey up to its 7th edition (2013), as well as the Zondervan Study Bible (2015). Donald Arthur Carson was born in Montreal, Canada, in 1946. His undergraduate degree majored in mathematics and chemistry. He went on to undertake a Master of Divinity with a Baptist seminary and earned his PhD in New Testament from Cambridge University in 1975, the same year he married his wife Joy. In 1978, Carson joined the faculty of Trinity Evangelical Divinity School, where he has worked ever since. In 2005 with Tim Keller, Carson founded The Gospel Coalition (TGC) - a network of Reformed churches dedicated to engaging and transforming the wider culture through speaking events, online advocacy, and publication. He continues to be an active guest lecturer in church and academic settings around the world. Carson lives with his family in Liberty, Illinois. In his spare time he enjoys reading, hiking, and woodworking.